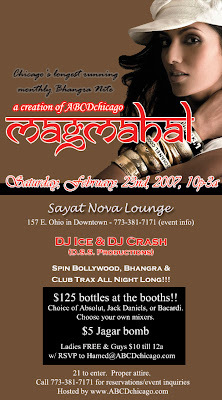 Bollywood, Bhangra & Club trax all nite! - $125 bottle special at the booths! Choice of Absolut, Jack Daniels, or Bacardi. Tip excluded. Choice of mixers. Click here to RSVP for Ladies FREE and Guys $10 till 12a. 21 to enter. Reduced parking at PARK1 garage on St. Clair between Ohio and Grand Avenue.